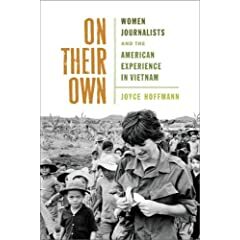 On Their Own: Women Journalists and the American Experience in Vietnam by Joyce Hoffmann - Jimmie Aaron Kepler, Ed.D. Researched and written over the course of ten years, On Their Own is the story of a fundamental shift in journalism, the point at which the “boy’s club” of war reporting in World War II and Korea gave way to the modern press corps of Iraq and Afghanistan, and a more vivid perspective on the causes and casualties of war. At the outset, they had to fight for the assignment; after they got it, the women profiled in On Their Own produced work that led one critic to suggest, in 1986, that Vietnam had been the first war recorded better by women than by men. Joyce Hoffmann has written for the Washington Post, Chicago Tribune, the Philadelphia Inquirer, and several other publications over the course of her twenty-five year career. She is currently a professor of journalism at Old Dominion University and public editor of the Virginian-Pilot.